Just a few years ago, we would have called the minivan market near obsolete. Major manufacturers unceremoniously dropped vans from their lineups, replacing them with popular crossovers and SUVs. But the downsizing of the minivan segment has led to heated competition between the remaining participants. 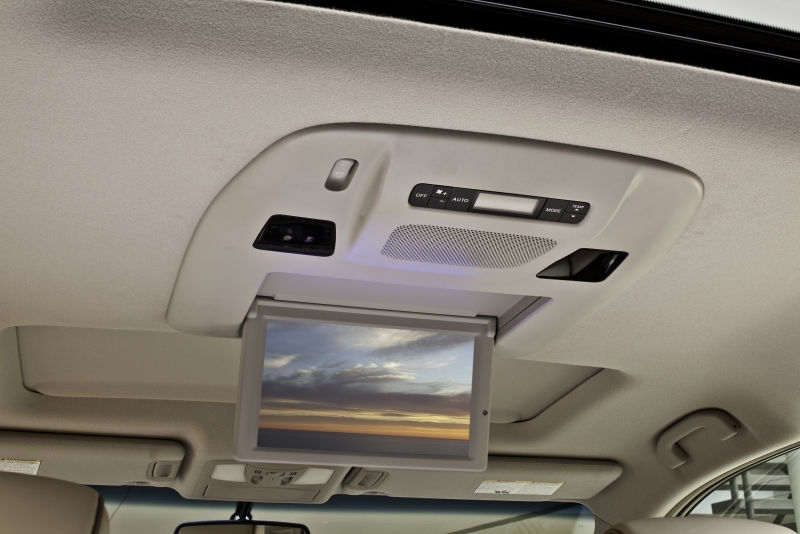 And in 2011, five minivans have received major overhauls to entice growing families that, whether they like it or not, need a minivan’s functionality to get them through the day. 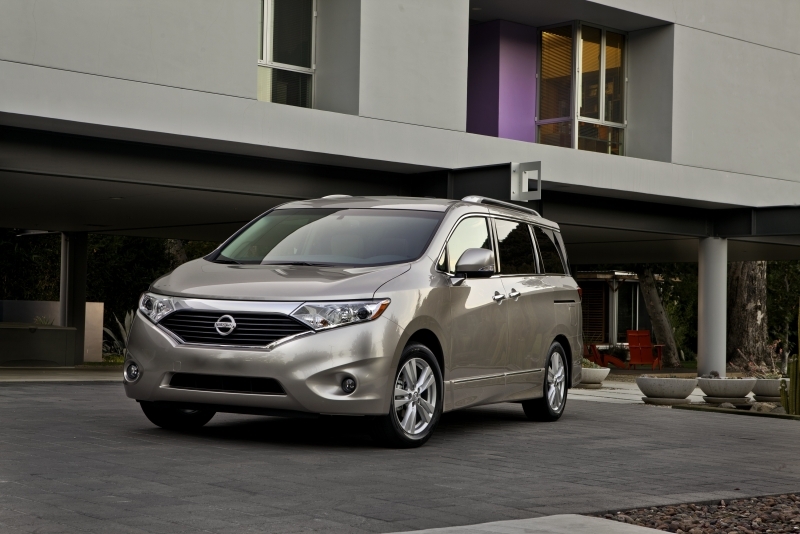 The 2011 Nissan Quest is the latest van to bring an all-new look to market. It feels more grounded in its drive and boasts a more aggressive exterior – perhaps the most intriguing of the bunch. The blunt, angular look is reminiscent of, well, nothing else in the segment, which is a good thing for some minivan buyers out there, and the interior is flush with high-quality materials. Sure, it’s lacking in cargo space and there’s no hiding the barely adequate gas mileage that minivans continue to deliver, but the Quest is different – and we always like an individual. The design may not be for everyone, but we think it’s a unique take on minivan styling. Nissan has lowered the step-in height and added grab handles to allow for easier access to rear seats. The DVD screen, should you opt for it, is good quality and large enough to keep the kids happy. Sixteen cup holders hold everything in place. 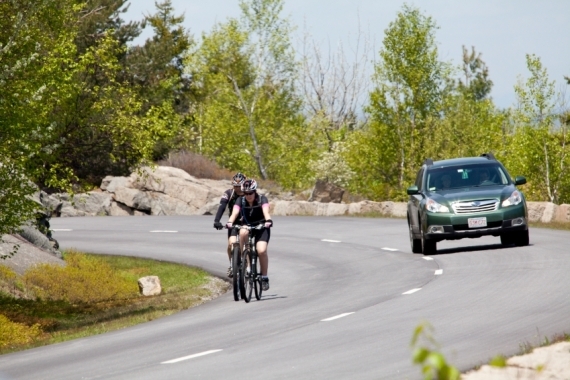 Noise levels when on the freeway are too loud for our liking – not an unusual problem in the segment. The video system won’t play movies through an iPod, only DVD or RCA plug-in, and the folding rear seats tuck away with a pull of a strap – the whole contraption looks a little cheap. Cargo capacity is underwhelming compared to the rest of the segment. The Quest doesn’t suffer from the vague drive that many in its segment fail to overcome. It sports decent handling for the class and strong, on-point steering with a good amount of feel through turns. Only one engine choice is available – typical to the segment – and the V-6 provides solid acceleration when needed. The ride is forgiving, with just a tad too much road noise emanating through the wheel arches and into the cabin. All in all, the Quest is a comfortable car to drive or be driven in, the only disappointment is the CVT. This particular transmission sluggishly moves through gear changes and exhibits a low, fairly annoying whine at higher rpm. The Quest uses the same 3.5-liter V-6 engine found in a number of Nissan vehicles, which produces 260 horsepower and 240 lb-ft of torque. A CVT (a type of automatic transmission that doesn't truly shift) goes though gears electronically but produces a whine at higher rpm. This Nissan is front-wheel drive. 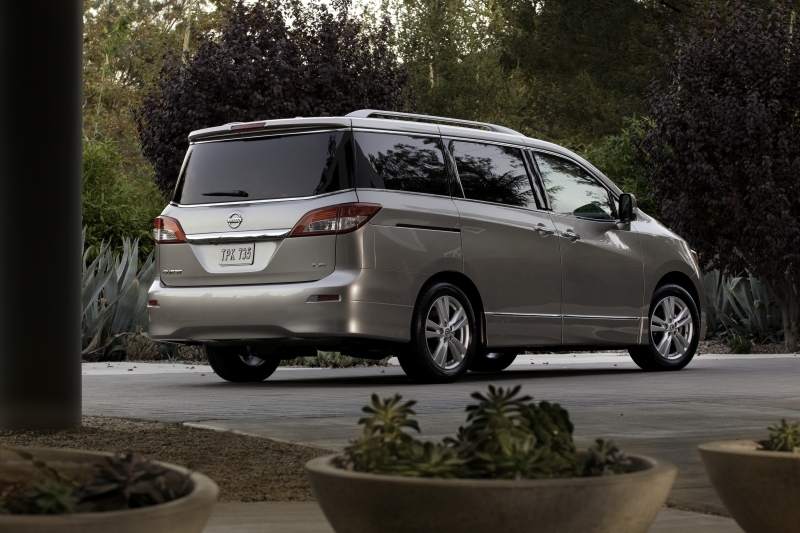 Having a plethora of features is par for the course within the minivan segment. 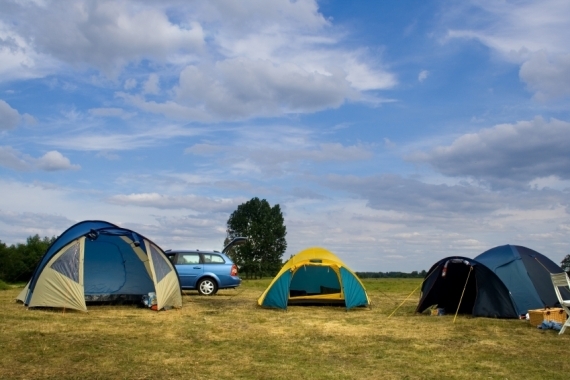 What you get also depends heavily on the trim level. The basic S comes stocked with fully folding second- and third-row seats and a whole array of safety elements, like air bags and ABS. At the other end of the spectrum is the LE, which has (for starters) an eight-inch touch screen, voice recognition features, a 13-speaker Bose audio system, a blind spot warning system and USB connectivity. Other options include a dual-pane moonroof, rearview monitoring system and Bluetooth, just to name a few. Nissan opted to skip the split-screen entertainment system that Toyota and Honda now have and instead features a roof-mounted 11-inch monitor behind the front seats that comes with two wireless headsets ($2,100). If it’s not already included, we’d recommend the 12-speaker plus subwoofer Bose audio system ($1,300) with XM satellite radio capability. Generally not a fuel-efficient class, the minivan suffers from lack of aerodynamics above all. The Quest’s 19 mpg city and 24 mpg highway numbers aren’t surprising and are similar to the rest of the segment. When’s a hybrid or electric minivan going to happen? Marker stains and luxury generally don’t mix, which is why it’s pleasantly surprising that the Quest’s interior is quite nice. Materials are of high quality, perhaps best in class, and while there’s no alcantara headliner, every seat is comfortable and roomy. 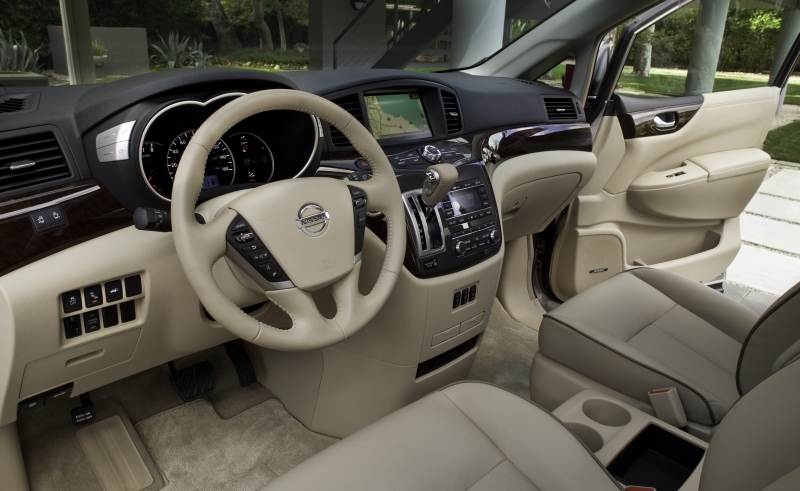 The driver’s console looks upscale and puts everything within reach, and you’ll find storage areas everywhere you look. Nissan has dramatically revamped the Quest’s styling, which now features a blunt snub-nose and angular, aggressive (for a minivan) lines. The windows create a wrap-around look that reaches to the near-vertical rear end. It’s a design that stands out from the crowd. The minivan market may be small, but nearly every member has refreshed or completely redesigned its offering in the last year. 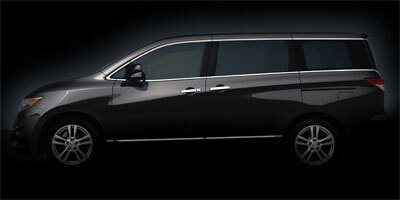 Nissan’s Quest starts at $27,750 for the 3.5 S and reaches a lofty $41,350 for the fully loaded LE. That’s on par with the heavy hitters in the segment, like the Chrysler Town & Country, Toyota Sienna, Honda Odyssey and Dodge Grand Caravan. The Quest is a different looking minivan for a different type of buyer. The lack of cargo space and fewer bells and whistles may seem like a compromise, but the unique styling and strong performance will be more than enough for some. It’s a welcome change to see an upscale looking interior in a minivan as well, and pricing the Quest in the middle of the pack helps its cause.